It begins! 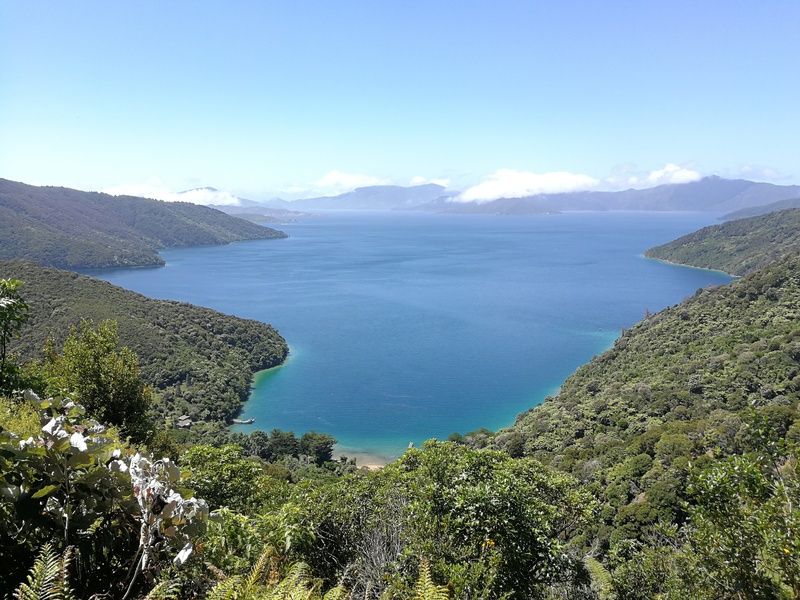 This section covers my faffing around in Wellington and the Queen Charlotte Track. 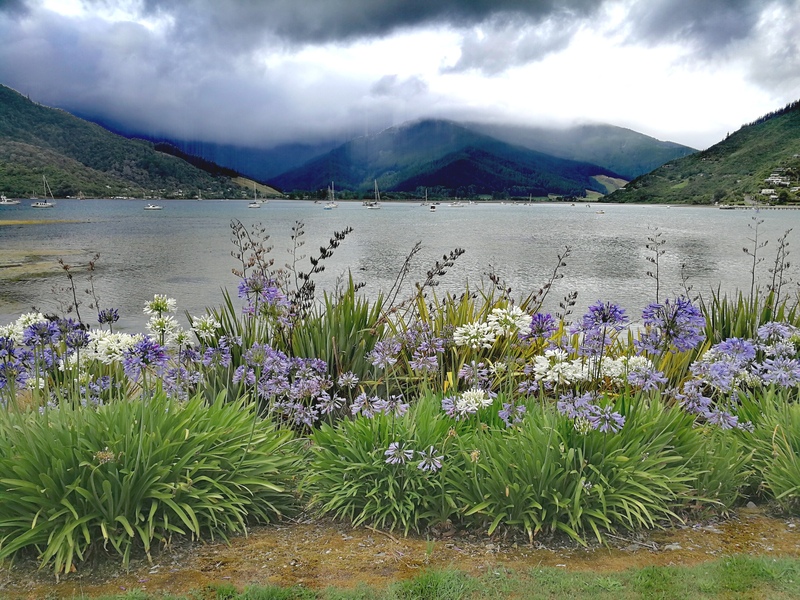 2 days after leaving home, I arrived bleary eyed into a stormy New Zealand. 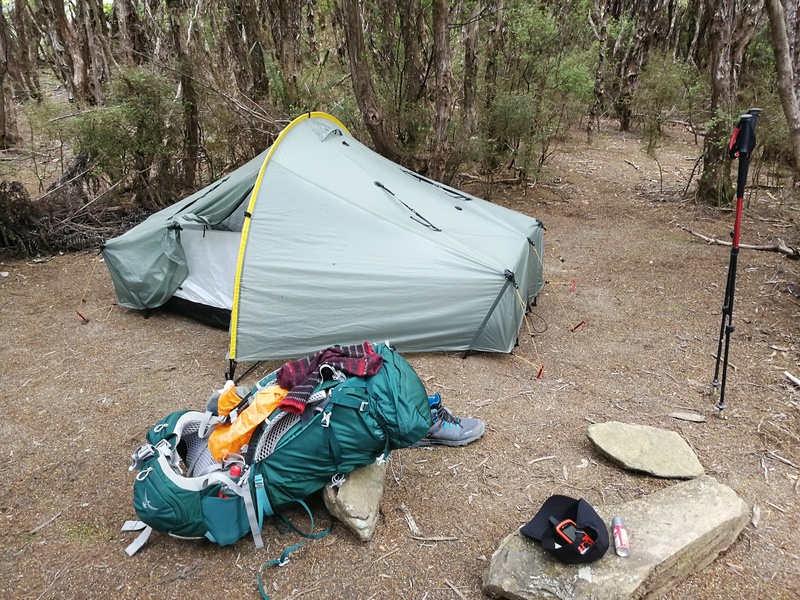 At Auckland, biosecurity had taken my tent, pegs and walking poles to be cleaned, popped through a hole in the wall once deemed safe – the whole process took less than 20 minutes. I flew straight on to Wellington where I picked up a local travel SIM card from the Vodafone stand and then got the airport shuttle which took about 20 minutes from the airport to the Hotel Waterloo & Backpackers. I went to sleep pretty early. I ummed and ahhed for ages about how many resupply boxes to send and where to. In the end I went for 4 – Pelorus Bridge, St Arnaud, Boyle River, and Arthurs Pass. Others choose to hitch out to resupply and send fewer boxes, e.g. hitch to Nelson to supply for the Richmond Ranges, a or stock up at the smaller store in Havelock. 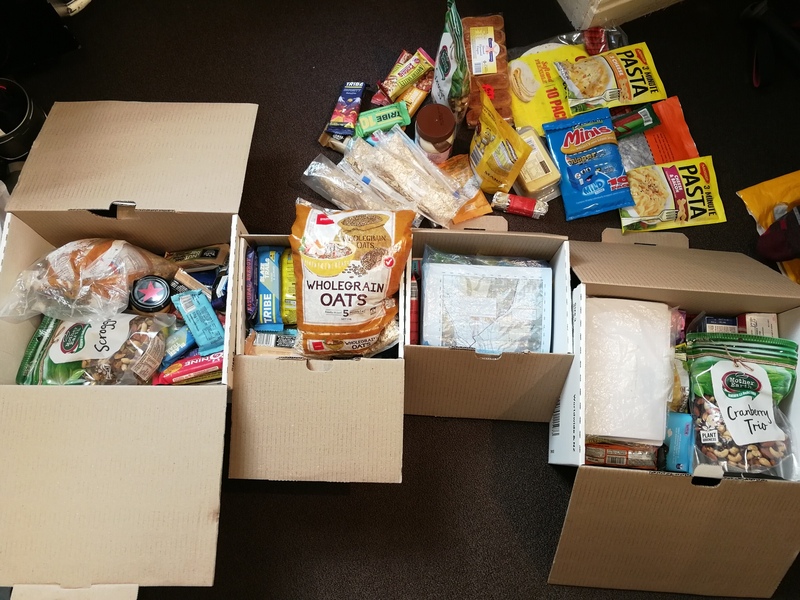 I’m not just sending food though – I wear daily contact lenses (easier and more hygienic on the trail) which are bulky if not particularly heavy, the same of which can be said for tampons etc, and the maps for later stages I’ll send ahead. New Zealand post offices are often closed on Saturdays as well as Sundays it turns out. There was one open until 3pm in the centre so after dumping the food shopping in my hotel room I went to get some boxes from the post office. I sorted out the contents back in my hotel room, then realised I couldn’t carry them fully loaded back in one trip so put the two larger ones in my rucksack and carried the smaller two. “Are you doing the TA?” asked Mike in the post office as I unloaded my rucksack. It’s pretty obvious I guess. He’d just finished the north island and we had a chat for a bit – he was getting the ferry a day or two after me but I was sure he’d catch me up at some point. I went to Te Papa national museum in the morning which was really interesting, about the geology of New Zealand, European settlers and the ensuing conflicts, as well as the flora and fauna of the islands. I walked around the harbour area, savouring the last period of unencumbered walking for a while. I went back to check out of the hotel, keeping a bag out for hand luggage for the ferry but my backpack was still very full with food, which didn’t bode well for the longer stretches. That’s probably my main/only gripe about the Scarp tent – the packed size is pretty big, taking up a lot of room in my backpack. I then got the free shuttle bus from the train station to the port for the Interislander ferry Wellington to Picton, 2.30pm-5.55pm. The tail end of the large storm that had covered most of the north island made the crossing pretty choppy until the shelter of the islands. It was a sunny day though and the views were gorgeous. I checked into the hostel then went to the supermarket to get some dinner. The hostel (Atlantis Backpackers) wins points for free dessert in evenings, but loses them due to the bizarre glass-less windows at the top of the walls in the dorm rooms meaning you could hear every rustle in other rooms. But it was a nice hostel, and had 5 cats to play with. I took the Beachcomber ferry from Picton to Ship Cove, leaving at 8.00am. 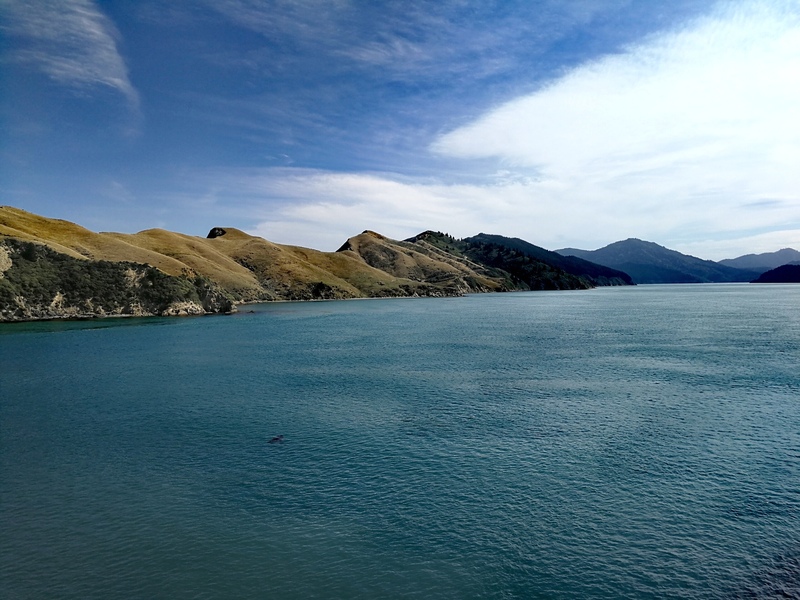 It was a gorgeous day and the boat ride out had unexpected fauna delights – a group of King cormorants, swarms of jellyfish and a brown seal sunbathing on the jetty of an island which some people were trying to disembark to. It yawned and slapped its flippers around. My what big teeth you have. Eventually it rolled into the sea. We got to Ship Cove at 9.30am and I had a look around the Captain Cook monument before setting off. Daaaamn my bag was heavy. I think that constituted 50% of my thoughts for the day. With the water and 6 days of food I estimated it to be around 18kg. I looked enviously at the QCT walkers with day bags, getting their luggage transferred. The track started steeply and muddy, slick from the recent downpours. I took my time but was still sweating instantly. It was about 25 degrees with UV level of E for extreme but thankfully the track was mostly sheltered/dappled shade. The walk wasn’t as busy as I thought it might be, and I fell in step with Mike, Cathy, and their boys, a young family who provided a welcome distraction from my bag. They were English and had emigrated 15 years ago. Their lifestyle sounded pretty great… We paused for lunch and I saw my first weka – hoping to mop up any crumbs. A lot of the track was in forest but it made the view points more dramatic in contrast. What I hadn’t expected was the constant shrill of cicadas. It gave the damp native forest a jungle like feel. I had to take a few bag breaks on the last 5km, but I was enjoying the views. Eventually I came to Miners Camp and the owner came down to show me around. There was a trolley of bags waiting for their walkers. “And those with big backpacks still beat em!” he chuckled. I had a shower and rinsed some clothes – with the sun and wind they dried quickly. I tucked into my family size bag of peanut M&Ms and headed to the jetty for a lie down with a view, and saw some rays float by. I met Ali and Liv back at the campsite who were also on their first day of the TA doing South island only and we shared moans over backpack weights. Dinner was 3 min cheese and bacon flavour pasta, which I added salami and cheese to. It was pretty tasty which was a good thing considering the number of those pasta packets I’d put in my resupply boxes. The cheese had got understandably hot in my bag and my penknife cut it like butter. Yum. There were quite a lot of sandflies around so I retreated to my tent. I left camp around 8am and the sun had already burned through the fog. Another scorching day. For the first 20 minutes I felt great. Then my shoulders started to complain again. The first couple of hours were relatively flat near the shoreline, with great views around the bays. “Morning! Oh hey!” I replied automatically then turned to see Cathy come running up behind me. She was running today’s section and the rest were carrying her day bag. Good for her. Think I’ll stick to walking in this heat. The track then started a long climb and I was dripping with sweat for the rest of the day. The trail was much quieter than yesterday and I only saw a few people walking back to their cars at the saddle. I was getting low on water and a bit worried – there wasn’t guaranteed water at the camp as it was a rain water tank and there hadn’t been much rain. At the next lookout point there was a helicopter landing field with a tank propping up a sign. I had a look in the tank and it was half full with water – if it turned out there was no water at the camp then I could come back. It was a steep down and up to the camp so I was very thankful to find water when I turned the tap! I drank half a bottle straight away. I pitched my tent in one of the little glens behind the shelter then went back to sit on the bench staring out at the view. The girls arrived a little later – they’d carried 3 extra litres each from Camp Bay because of water worries so weren’t very happy to hear there was water here! We sat and ate looking out across the bays, shooing away the friendly weka at regular intervals to defend our food. Just as we thought we had the place to ourselves a Dutch hiker, Thomas, landed who had walked all the way from Ship Cove today. He at least had the grace to look tired. It’s funny how logic can be time bound. For example, at 1am in a remote camp spot I can tell myself that logically no one would walk up here just to murder someone, but that was little use. Eventually I must have fallen back asleep as I was woken at 6am by noisy wekas. I got out and went round to the shelter and sat down watching an amazing sunrise over the peaks. Thomas joined and made breakfast and was on his way by 7, as the girls were waking up. I must have watched the view for over an hour. Today was a shortish day so there was no rush, but my stomach started rumbling so I made some porridge and mixed in scroggin (NZ style trail mix). There were still some steep climbs but the theme of today was gentle-ish downhill. Regardless, it was incredibly humid and I was sweating heavily once more. Lunch was at black rock camp shelter, which whilst nice we agreed ours had had the better view. I signed the logbook and saw that there was a group of 8 TA walkers 2 days ahead of us. It was weird to think we might not see them except following the hut books. I took my time enjoying the view and eating nutella from the jar, then set off after the girls, catching them up about half an hour later. We walked together for a while which made the km go quickly as we chatted about various gear and strategies. Reaching a saddle we left the QCT to go down to our campsite, noting how steep it would be to go back up tomorrow morning. The site was right by the water so after pitching tents we went for a quick dip to cool off. It started drizzling and we looked at the trail notes for the upcoming sections and cracked into our food bags whilst shooing away weka that got too close. I felt like the height of fashion in my (merino) wool leggings and long sleeve shirt. We wondered if 4pm was too early for dinner. I booked a shared room for the 3 of us at Anakiwa Lodge for tomorrow night and we got very excited at the prospect of a bed and shower. They even had a hot tub. The drizzle turned to solid rain so we moved to the cooking shelter to read and then cook dinner. Instant noodles for me with scroggin for dessert. The forecast for the next few days didn’t look good and we wondered if we’d been very lucky to get 3 dry days to start. The temperature dropped and we retreated to our tents where I read until it got too dark. There is no quiet way to deflate a thermarest. I think most people in the campsite were already stirring, but I felt very conspicuous undoing the valve to a massive whooooosh. The rain had continued through the night but I had been cosy and dry in my tent. I packed everything up inside my tent then went to make breakfast in the shelter. Someone had moved their tent to half under the shelter during the night as it had started leaking – she got a water taxi to collect her and her sodden belongings. The forecast was to either stop raining around noon, or continue for a few days. Lots of people at the camp were talking about skipping today’s walk. I set off up the hill. Despite my skepticism it did indeed only take 10 minutes of climbing to reach the QCT again, but by that point I was sweating so much from wearing full waterproofs. 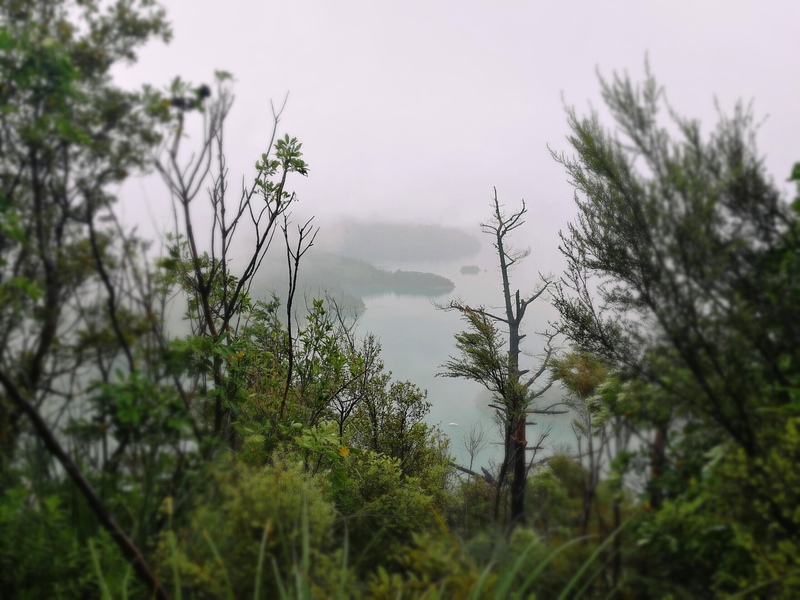 I ascended slowly but steadily up the climb and it took me 20 minutes to notice what felt different about today – due to the rain there was no constant scream of cicadas so it was just my breath and the birds. There were no views from the top but I sat on the bench to ease my shoulders and eat a snack bar. Then it was down and down then up and up. At the start of the next ascent I shed my waterproof jacket as the rain had turned to light drizzle and it was so humid that I was getting wetter with sweat with the jacket on. I instantly felt much more comfortable. After the next down which spat me out onto a road saddle. I was an hour ahead of the DoC guide time, so made a conscious effort not to walk too fast in the next section as I didn’t want to get blisters or overwork anything. Instead, I played leapfrog with a family for the next few km, as we took breaks at different times and overtook each other in turn. I kept thinking that maybe this walking malarkey was getting easier, then my shoulders would start screaming and I’d have to take a break. Lunch was the usual 2 tortilla wraps – one with cheese and pepperami, one with nutella – at a lookout point with the view coming and going as the clouds bounced around. I bumped into Mike and Cathy again, who said they’d been thinking of me in a tent in last night’s rain, but I assured them I’d been fine. They’d also met Ali and Liv, and I told them how we were staying together. The rain never stopped but came and went in its severity, though I didn’t put my jacket back on as the trees often provided enough shelter. My feet were starting to get sore and my shoulders were burning, and I was starting to think a rest day in Havelock might be a good idea. I caught up with Mike and Cathy at the 1km to go signpost and we walked the rest of the way together, chatting about the rest of the Te Araroa. Eventually the trail opened up to Anakiwa and the end of the QCT. There was a conveniently placed snack van where I bought an ice cream and ate it sat on a bench looking out over the waters, rain be damned. Cathy came back up to me and gave me her number “just in case” which was very kind and gratefully accepted. I bid them farewell and went to find the YHA Lodge up the road. We had a room for just the three of us so I exploded my things everywhere and the girls arrived about half an hour later. Once the soggy items from today were hanging up, next on the agenda was the hot tub, with beers. It was glorious. When we were sufficiently prune like from our soaking we had proper showers and then moved to the next item: food. We got 2 jumbo pizzas to share and scoffed them contentedly. They were in agreement that a rest day was probably a good idea before entering the Richmond Ranges. Our room smelt of wet tent and socks. We all slept amazingly and were reluctant to leave our duvets. But breakfast called. We took our porridge to the kitchen and I put my gas canister in a bowl of water to judge how much I’d used in the last 4 days and whether I’d need more to get through the Richmond section – I hadn’t used much. I walked with Ali and Liv as it was a lot of flat road today. We set off under a grey sky but we remained mostly dry. From Anakiwa to the main road there was a ‘link pathway’ which followed near to the road but meant we didn’t have to dodge the cars. We saw some black swans as we left the village and falcons swirling above. After a few km the pathway ran out and it was walking on the road verge when there was one, else the road. It was a long straight road but we chatted away the km. The link pathway reappeared so we left the road for a bit and had lunch in drizzle overlooking the water. I finished my nutella jar. For the rest of the way the path rose above the road into the forest. We were just commenting what a nice job someone had done trimming the overgrowth on the path when we turned the corner and met a man with a chainsaw. We passed on our thanks for his voluntary work and he wished us luck on our walk. We rounded the headland and laid eyes on Havelock, where we were now quite glad we would have a rest day tomorrow. We each had a few niggles and my feet were pretty sore. Hopefully a day of rest and eating would give them a chance to toughen up. I was staying in the Rutherford hostel and the girls went to the holiday park. I’d booked the one night yesterday afternoon so booked the second when I arrived. I dumped my things and showered. I had a wander around Havelock (there’s 1 road, it didn’t take long) then met the girls at the Mussel Pot for dinner. We’d seen the posts on the Te Araroa Facebook group about severe weather warnings for the middle of next week, but after debate decided that we’d still go to Pelorus after our rest day and start the section, knowing that we’d likely have to sit in a hut to wait out a day of torrential rain and wind, or even that we’d have to turn back due to high rivers. None of us fancied sitting in Havelock for a week, and if we waited for a 10 day forecast of good weather we’d be waiting forever. Liv assured me the mussels were indeed amazing, but I stuck with food I knew I liked – burgers. Paired with a local Marlborough white which was delicious. Everywhere seemed to close at 8pm which I guess was fair given the lack of people in the town (they all seemed to be in the Mussel Pot). Rest day didn’t start particularly well with the room next door playing loud music at 3am and the walls were really thin. Eventually I went round and knocked on their door asking to turn it down and they assured me they would, but it carried on another hour. The beds were comfy though. The day improved as I went for breakfast in a cafe and ordered everything. I did some laundry then had tea with the girls as we discussed tomorrow and agreed we would wait the weather out for a few days somewhere else. Mike and another girl had also bailed, the rivers would just be too high. 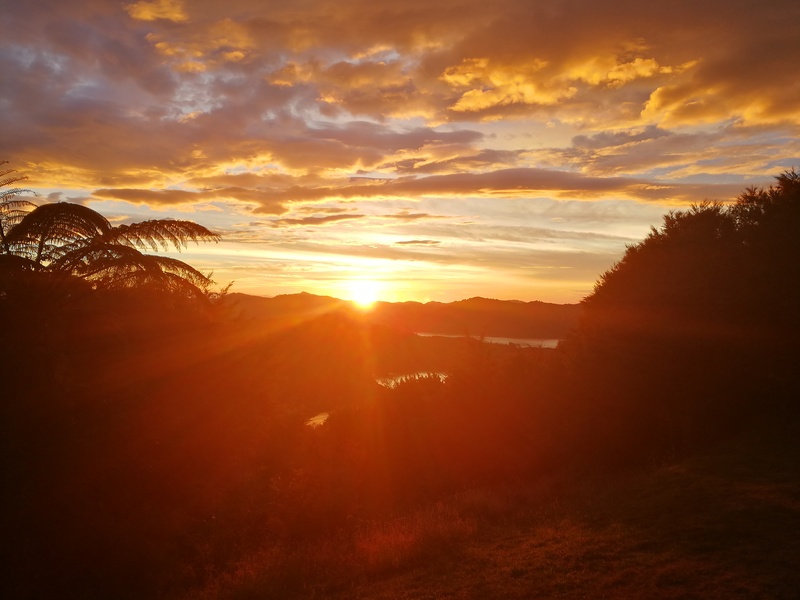 The plan is to hire a car and go down to Kaikoura – the east coast has a much better forecast as the storm is meant to sit over the west coast – and come back to Havelock Tuesday afternoon, to restart the walk to Pelorus on Wednesday. Good stuff so far – lovely to read all about it! I am so so enjoying reading all about the adventure 🙂 Thanks for writing it all up! Wow… this is all absolutely fabulous. Good luck with the rest, and hope it’s equally as stunning.